There’s a quaint little beach nestled near the heart of downtown Naha City, inside Naminoue Umisora Park, and it’s celebrating this weekend with a beach festival. 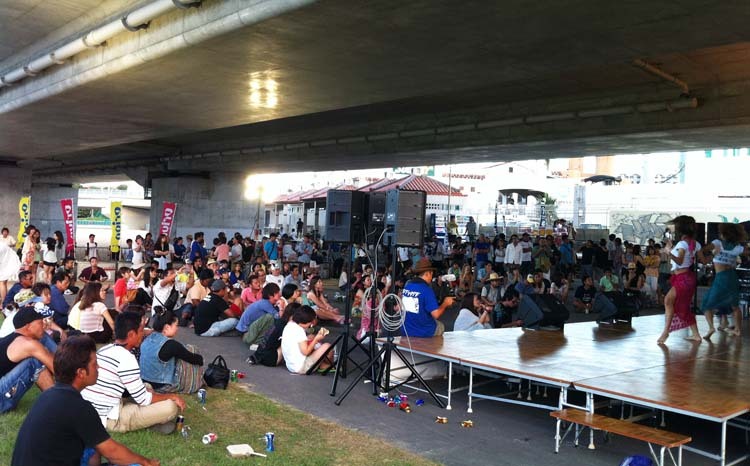 The main stage is under Naminoue Bridge that gives some shelter in case of a sudden rain squall. The Okinawa Beach Festival takes place in Umisora Park, adjacent to the Naminoue Beach in the Naminoue Umisora Park. Naminoue Beach is very unique, located in the middle of an urban area and also Naha Airport. Naminoue attracts both locals and tourists. Despite being close to downtown, a variety of sea creatures including coral and fish can be seen under the water. The atmosphere is casual as is fitting for a true beach party. Gates open at 3 p.m. and the festivities really get under way 5 p.m. ~ 9 p.m. Admission is ¥3,500 for males and ¥2,500 for females. People enjoy marine activities like snorkeling and diving at Naminoue Beach. Other than that, interestingly, there is a workshop on coral planting experiences. One of the unique things of the park is that it has two mailboxes are installed, one is underwater in the sea and the other is by the shore, and will be sink in the water in high tide. 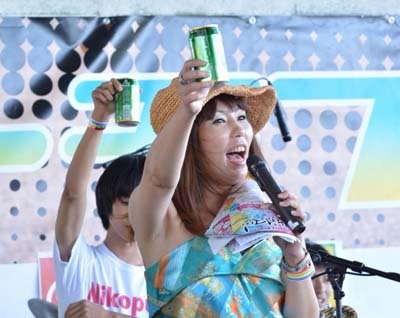 Things at the Beach Festa really get underway after 5 p.m. although gates to the venue open already at 3 p.m.
Saturday at the Naminoue Beach side of Naminoue Umisora Park! The festival has scheduled many events, including live shows by popular local artists. For example, one is a sanshin performer, Kazuya Gibo who got won the second prize at the popular TV audition program, ‘X FACTOR OKINAWA JAPAN’. From the sunset, around 7 p.m., DJ time will start by local DJ’s including a female! The beach will become a dance club with laser beams and smoke. Of course, there will food and beverages by vendors. People can enjoy all kinds of beverages with ¥100 per beer, Awamori, cocktails and soft drinks. The Beach dish grand prix will be held in an area adjacent to the festival. 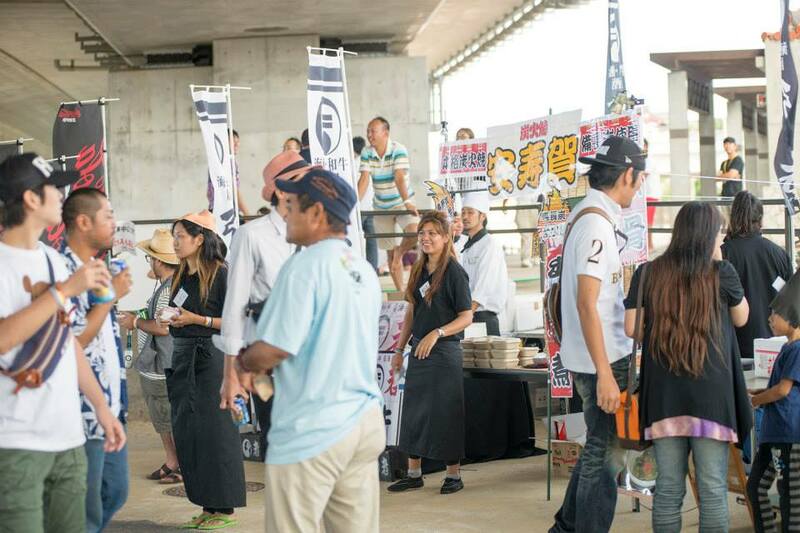 A total of eight local restaurants will serve their recommended dishes, all costing ¥500. The Grand Prix winner will be chosen by vote of the audience. Fireworks will be launched over the water shortly before 9 p.m. to conclude the festival.